Which NBA teams will earn most improved accolades this season? Brooklyn Nets correspondent Lou DiPietro asked the YES announcers to weigh in. The Brooklyn Nets come to Cleveland tonight to take on the Cavaliers in Game 1 of both squads’ regular season slates. Last season Brooklyn finished 49-33 and lost a tough first round playoff series to Chicago in 7 games. The 2012-13 Cavaliers ended up at 24-58, suffering through several lengthy injuries to key guys. The Nets made many significant additions in the offseason with the goal of winning a title in June. They traded picks and players to the Boston Celtics for championship-pedigree Kevin Garnett, Paul Pierce and Jason Terry. They also signed former All-Star Andrei Kirilenko to come off of the bench. Owner Mikhail Prokhorov hired 40-year-old Jason Kidd as the new head coach, seemingly minutes after his 19-year Hall of Fame playing career ended. With a payroll north of 100 million dollars, the league’s highest, Brooklyn goes into this season with what many hoops heads think is the best first five in the NBA: returning Nets PG Deron Williams, SG Joe Johnson and C Brook Lopez tipping off with KG and Pierce. Every member of the starting five has been an All-Star, a distinction that none of the other 29 NBA teams share. There was plenty of excitement on the Cleveland side as well this offseason. Owner Dan Gilbert brought back Mike Brown as head coach after he was let go in 2010. They chose the 6’8” ultra-talented UNLV freshman Anthony Bennett with the #1 overall pick in draft. In addition, they signed veteran 7-footer Andrew Bynum, who when healthy is one of the top big men in the league. 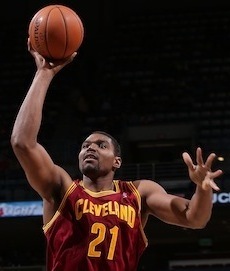 Bynum’s status is listed as “to be determined,” so he may not suit up for the Cavaliers for while. The Cavs now have a slew of young players to develop and build around, with the leader on the court being PG Kyrie Irving. Irving, entering his third year, averaged 22.5 ppg, 5.9 apg and 1.5 spg last season. Joining Irving in the backcourt is second-year 2-guard Dion Waiters, who was selected #4 overall in 2012. In his rookie campaign Philly-native Waiters put up an impressive 14.7 ppg. Up front, third-year PF Tristan Thompson (#4 pick overall in 2011) averaged 11.7 ppg and 9.4 rpg playing in all 82 games. Throw in the relentless veteran C Anderson Varejao and second-year 7-footer Tyler Zeller and Cleveland has a solid core capable of making a legit run at a playoff spot in 2014. Tune in to the YES Network at 7PM ET to watch the new-look Nets take on the rising Cavs in the Rock and Roll Capital of the World. The 15-14 Brooklyn Nets welcome the 7-24 Cleveland Cavaliers to the Kings County this evening. After starting 11-4 in November, the Nets dropped 10 of their first 13 games in December. Head coach Avery Johnson, who had been in the lead chair since the beginning of the 2010-2011 season, was fired on Thursday and replaced by interim veteran coach P.J. Carlesimo. Nets owner Mikhail Prokhorov has stated that he has a lot of trust in Carlesimo but wouldn’t rule out a coaching search in the near future. The names Phil Jackson and Jeff Van Gundy have been mentioned as possible candidates. Brooklyn won last night at home against the woeful Charlotte Bobcats, 97-81. The Nets Big 3 Deron Williams, Joe Johnson and Brook Lopez combined for 61 points to help deliver Charlotte their 17th straight defeat. Lopez led the team with 26 points, 11 boards and 3 blocks. The Cavaliers also played last night, losing to the Atlanta Hawks in Cleveland,102-94. Second-year PG Kyrie Irving had 28 points, 5 dimes, 6 boards and 4 steals in the defeat. Coach Byron Scott’s best big man C Anderson Varejao sat out his fifth straight 48 with a bruised right knee and has been ruled out of tonight’s contest as well. The Nets topped the Cavs 114-101 at home in their previous meeting on November 13th. NJ native and childhood Nets fan Irving put up 34 points ,and Varejao had a career-high 35 points and 18 boards in the defeat. Tune in to the YES Network tonight at 7:30 PM ET to see if Brooklyn can pick up another W under new head coach Carlesimo before heading off on a difficult road trip with stops in San Antonio and OKC.